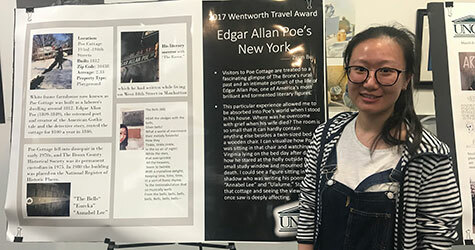 Randall Library is proud to host the Spring 2019 UNCW Wentworth Fellows Poster Session, Wednesday, April 10 through April 12. Please stop by Wednesday, April 10 between 3-5 PM to meet the fellows in person and to find out how Randall Library can help you with your travel and research projects. The Wentworth Fellowship, a gift of Mr. Charles F. Green III, was established in 2001 to enable a select number of students to travel to sites in America and abroad that are associated with literary authors and texts. Each year, students work with faculty sponsors to submit applications detailing journeys inspired by and connected with a specific text, author, or movement in an effort to explore the relationship of artistic production to geographic space. In the past, Wentworth Fellows have travelled to places as diverse as Beijing, Moscow, Oxford, Berlin, Prince Edward Island, and Providence, Rhode Island.